I have this friend who can really eat hot spicy hot food. There is no capsaicin pepper that is too hot for her. She eats cayenne pepper sauces by the spoonfuls, and I am not exaggerating. We have gone to a Chinese restaurant on a few occasions, and she took spoonfuls of the hot cayenne chili sauce and covered her food like gravy, and she even licked the cayenne pepper sauce spoon. She does turn a bit blushed from eating so much hot red chili sauce, but she doesn't sweat. She says she kind of gets a mouth and taste bud high when she eats food this way. If I ate that way, I would be sweating, looking for anything to save my mouth from the burn and I would be really upset. What I think she needs to do is go on that Travel Channel TV show Man vs. Food, and challenge the dude to a hot food eating contest. I bet my friend could have won the "hot ramen challenge" at Orochon Ramen in Little Tokyo, Los Angeles, CA, where he downed a giant soup bowl of ramin made with 10 types of chili peppers. Anyway, my friend likes strong flavored food, including spicy food, and she loves ethnic foods like spicy Indian curries, red hot Chinese, and over the top flavorful Korean. 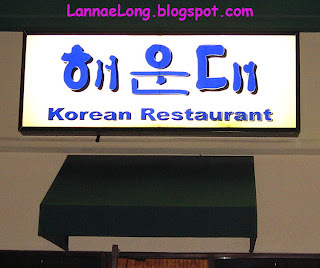 As we were eating dinner one night, she said she found a pretty decent Korean restaurant in Antioch, but she did not know the name of the place. She wanted to go there because their seafood pancake is so good, and the other food she tried there was really flavorful, and better than most other Korean places she has tried. I asked her what the restaurant name was, and she just could not remember. She said she thought it didn't have a name. She couldn't tell me how to get there either, although she had been there a few times. I was thinking that she was going nutty, but after she had me follow her in her car to this place, it became apparent that she was not nutty, and it is rather difficult to explain how to get to this place. First off, I have to give it up to my friend and her lack of directions. I could not explain how to get to this place either. I know how to get back there if I drive, but no way am I able to give directions. Get a GPS is my ownly advice. The restaurant is located near a crazy intersection off of Antioch Pike, a mile or 2 south of Harding Rd. It is tucked into the way back of a strip mall that seems to have many other Korean shops and a billiards hall which had only Koreans playing in it during the evening we went to this restauarnt. The problem is, this is a confusing interesection with multiple streets intersection, and an I-24 exit ramp is close by, and there are a few other stripmalls with the same situation of little stores with small signs that you can't tell what they are from the road. Maybe GPS or Google Maps might help, but directs from me or my friend are not happening. Second, I have to give it to her again, how is she supposed to know the name of the restaurant when there is no name of the restaurant on the sign! Hai Woon Dai doesn't have a sign saying Hai Woon Dai, it has a sign saying "Korean Restaurant". It is a smallish sign about the door. It is like stepping Repo Man and going to the grocery store and buying a can of "Food". I know my friend has good and adventurous taste in food, so I wasn't that scared to walk into the door under the generic sign. I walk in, and I swear, I was still in Repo Man, with stark white walls, stark white lighting, and very generic tables and chairs in what looks like old wood paneling cubicles. I got really nervous about flashing back 25 years into Repo Man. How could my friend who loves really strong flavors and chili peppers bring me to this funny generic Korean Food place that is just stark? But to my delight, the food was a different story, and pulled me out of the generic food movie, and into the present. We all sorts of kim chi made with garlic and peppers, and my friend just enjoyed every last bite of garlic and peppers. We got a seafood pancake that resembles a huge egg foo yung of yester-year. It was tasty, and filled with shrimp and squid. Note to people who don't like eating tenticles with suction cups, you may not want this dish. I, however love squid, so I was very happy. We got a spicy pork bulgogi, a fish dish, spicy tofu and fresh pork belly grill. The soup was ok, but I think Tofu House (specialty is the spicy tofu soup) is better for Korean style soup. The pork bulgogi was so damn flavorful, and probably the best bulgogi I have tasted in Nashville. The fresh pork belly grill-at-the-table was fun. The grill was actually a ceramic grill, not an aluminum or stainless steel grill. We cooked up the onions, mushrooms and the pork belly and ate it with gusto with the variety of kim chis. There was no room at our table because it was full if plates and dishes. I am sure there are dishes here that are going to be a hit or a miss depending on peoples taste. 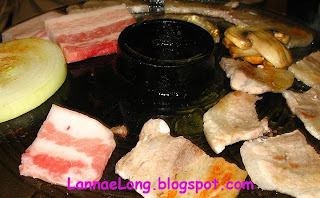 We really liked the pork bulgogi, and we like the grill-at-the-table options. Overall, we had a fun time getting "Food" from the "Restaurant". The two kosher dogs we got were really fun. The 1st one was onions, kraut, celery salt, dill pickle, and banana peppers. The 2nd was a straight up kraut and spicy mustard. To balance the meal, I got a salad. I know, I know, who wants salad at a hot dog joint. It is tough in Sandusky to get fresh veggies. Most of the chains there, and most of the other restaurants there, do not serve fresh veggies if they serve veggies at all. So, yeah, I got the mound of shredded iceburg as a side to my hot dog. I don't recommend the salad. 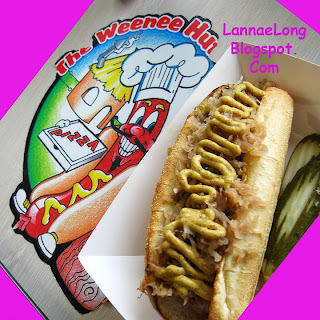 I am now looking back on the trip to Weenee Hut, and I am thinking, "Why did I bother with the salad, I should have gotten another hotdog!" I should have made a crazy hotdog with pineapple, chow mien noodles, A1, ketchup, Cheese Whiz, green olives and marinara sauce. That sounds like a great hotdog you would eat on vacation to Lake Erie and Cedar Point! If you want to help child hunger in the USA (yes, there is a hunger problem in the USA and the problem is growing during these uneasy economic times), put your money where your mouth is! Help support Share our Strengths - Taste of the Nation fundraiser to help stop child hunger. The Nashville Event is Sunday May 31st held in the historic Hermitage Hotel's Grand Ballroom. You too can bump elbows with the who's who of Nashville and the culinary scene. You would not believe who is cooking!! You know how much I love the food of Chef Tyler, Chef Tandy and Chef Debra, they are all coming to make their yummies for all who attend. I love it when my charitable giving goals are filled by such a delicious lineup. Do you want to go? Read on! Get a table for 10 for this event. You also get one of the evening's participating chefs to join your table for a course; name recognition in speaking program; logo or name recognition on website, email invitation, event signage and event program; full-page color ad in the program; and one souvenir program signed by all the evening's Chefs. Help! Join me, it is EASY! It is as easy as getting mail from a mailbox! Please donate non-perishable food items on Saturday. On Saturday, May 9th, letter carriers will again help Stamp Out Hunger! ™ across America with your help in order to provide assistance to the one in eight Americans who struggle with hunger. The Stamp Out Hunger! effort is the nation's largest single-day food drive, having collected more than 909 million pounds of food since its inception in 1993. Last year, letter carriers across the country collected a record total of more than 73.1 million pounds of food, but with hunger impacting many Americans– including working families, children and the elderly – help is needed now more than ever before. There is simply no easier way to help the community than to contribute nonperishable food items through the Letter Carriers Food Drive on Saturday, May 9th. Place your donated food items in a bag near your mailbox that day, and your letter carrier will pick up and deliver the food to Second Harvest Food Bank. Then, the items will be distributed by Second Harvest Food Bank to emergency food pantry programs throughout the community. Most needed items include: canned tuna or chicken, peanut butter, canned soup, fruit, vegetables, rice and macaroni & cheese.